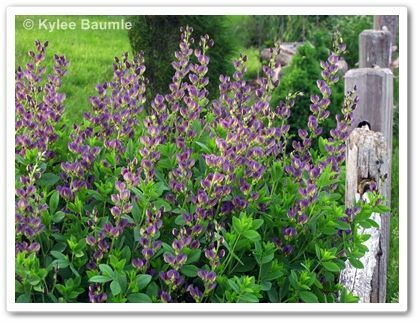 Our Little Acre: What's Eating the Baptisia? People often ask me, "How do you think of so many things to write about?" After more than five years of writing here at Our Little Acre, you might think I'd run out of things to say. Those of you who know me personally are snickering and muttering, "Fat chance!" Though there are times when it seems that subject matter is at a lower level, there's always something, to paraphrase Roseanne Roseannadanna. Usually, just spending a short time in the garden inspires me to expound on something or another and yesterday was just such a day. Some research revealed the caterpillar to be that of the Genista Broom Moth. 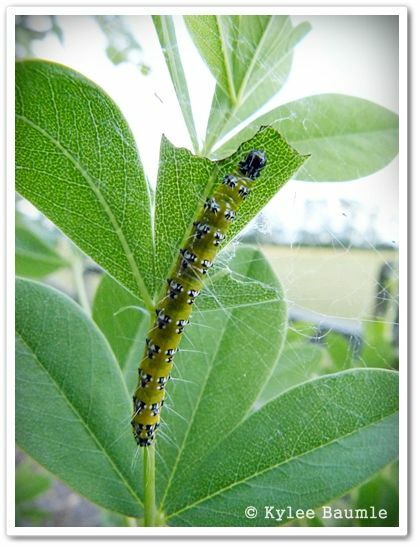 The caterpillar isn't a particularly beneficial insect; they can certainly wreak havoc on a Baptisia (as well as Genista, Sophora and Lupinus) and it doesn't take very long for them to do it either. So I spent over an hour cutting them and the webs they'd formed off. I thought maybe the chickens would like them as a treat. They like grubs and worms, so why not a caterpillar? I called them to the fence in my best falsetto, "Heeeere, chick chick chicks! I've got a treat for youuuuuuuuu!" That always gets them running to me, because they know I've got goodies. They are not fans of the fuzzy caterpillars. 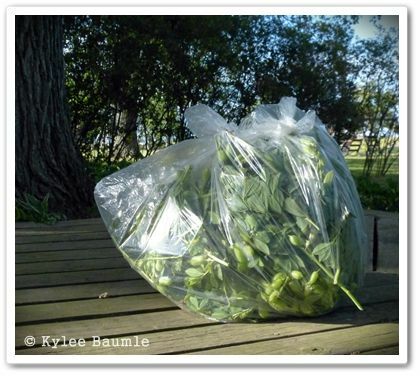 I bagged up the cuttings and the caterpillars and tied them in a plastic bag, then placed it in the garbage, which will be picked up tomorrow. I'm not taking any chances of them finding their way back to the Baptisia. It's interesting that of the three baptisias I have, so far only two of them are infested. Of the two largest, which are also quite close to each other (6 or 7 feet apart), only the Twilite Prairieblues™ had the caterpillars. The straight species Baptisia australis did not. Yet, a much smaller B. australis that I grew from seed several years ago, and 40 feet away, had a pretty heavy infestation. Other than manual removal such as I did, you can use Bacillus thuringiensis to control these pests. It wasn't hard to cut the ends of the branches off, which is where the caterpillars were (they like the tender new growth) so I prefer that method. Older established plants may survive the defoliation they cause if left uncontrolled, but younger plants likely won't. I'll check each day for cats that I missed and remove those as I find them. That was a bunch wasn't it? Darla ~ Oh, there were LOTS. It was disgusting. They ranged in length from a quarter-inch to about an inch and a half. Holy toot. I have one Baptisia plant, it's about 5 years old. Nothing has ever touched it, I thought it must be resilient to everything. There I go thinking again. You had quite a few munching on your Baptisia Kylee. They are picky about the blues. LOL! Your brave collecting them in your hand girl. LOL! Your Baptisia is beautiful! That is one plant that is missing from my garden.Have a lovely week. Kara ~ This is the first time I've ever encountered these! Baptisia generally is resistant to most things, so I was really surprised to find them. Anonymous ~ There are other web worms, so I don't know. Apple trees aren't one of the known host plants for this caterpillar, so it may be a different worm. They're disgusting, no matter what! Lona ~ Oh, those are just a few of them! I spent over an hour cutting them off. It was just gross. You need at least one Baptisia! I can't believe the chickens didn't go for that feast! Chickens in the cartoons are always chasing caterpillars. So much for my cartoon-based education, huh? Cindy ~ I know! It must have been the fuzz. You know...a texture thing. LOL. 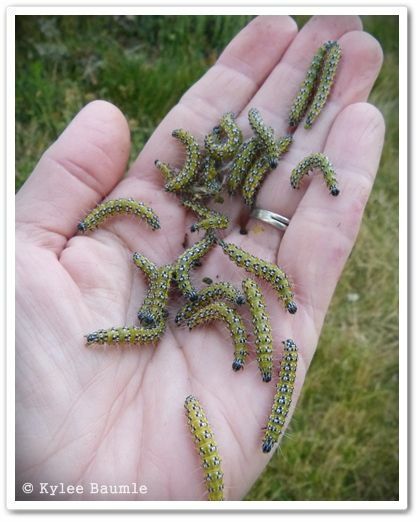 Thanks for the tips on getting rid of the moth caterpillars. Do you have any thoughts on slugs? We have a huge amount sliming around in a front yard flower bed and I see them early in the mornings tryin’ to get hidden for the day. I've done my best to gather what I could but they are continually there. I’ve looked for commercial pesticide but none of them say anything specifically about slugs. Many thanks and happy gardening! Oh my gosh! I've been searching everywhere (I thought) to find out what that caterpillar was that's decimating my Baptisia australis. It was so beautiful this spring and now this! I will do my best to hand pick and prune like you showed. Thank you for all your information and pictures. Now - what do you think the tiny little black bugs that can jump are that are sucking the life out of my clematis? 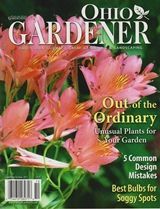 Gary K. ~ There are products designed specifically for combating slugs, but you can try putting sand around the base of the plants that are being targeted. The slugs don't like traversing textures that irritate them and sand does that. 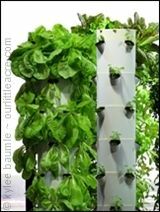 You could also put a saucer of beer near the plants. I'm told that they love it and they get in the beer and drown. I've only done the sand trick though, so can't say myself if the beer works or not. Good luck! Dollybelle ~ I'm glad to be of help! I don't really have any idea of what's bugging your clematis though! Sorry to hear you're having problems with that! LLB ~ In my blog post it tells you: "Some research revealed the caterpillar to be that of the Genista Broom Moth. 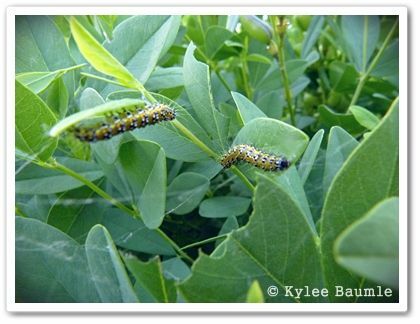 The caterpillar isn't a particularly beneficial insect; they can certainly wreak havoc on a Baptisia (as well as Genista, Sophora and Lupinus) and it doesn't take very long for them to do it either." 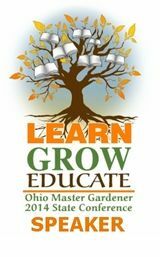 "Older established plants may survive the defoliation they cause if left uncontrolled, but younger plants likely won't." I allow the majority of caterpillars to stay, even the big fat tomato hornworms. 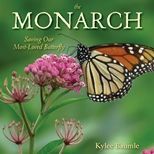 (Although I remove them from the tomato plants, along with some leaves and put them in the compost to munch there.) 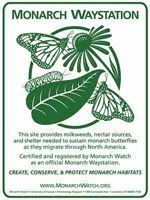 As regular readers of this blog know, I love butterflies and moths and our garden is a Certified Monarch Waystation. No chemicals used here, with one exception: We use one of only two known chemicals that will kill the Emerald Ash Borer and stop the destruction which has killed so many of our ash trees in this area. 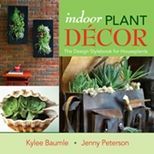 Sometimes you do need to take action because it may mean the life or death of a valued plant in your garden, too. When destructive bugs proliferate, it happens. I show no mercy for Japanese Beetles either.